I really don't know why I'm having such trouble uploading a Halloween picture but it isn't happening. So....can you pretend to see a picture of a nicely carved, but scary looking pumpkin and a cute little witch at the top of this post? I didn't think so...well, neither can I. Proves neither one of us has a good imagination! Today was *supposed* to be mostly for sewing - instead I spent over two hours balancing the chequebook and then another hour paying bills. Somehow that wasn't quite what I had in mind!! Anyhoo...don't let the wee ghoulies spook you too much tonight...have a happy Halloween. Here are three journal covers I just finished making from recycled denim and some scraps of fabrics I have in my stash. These are fun to do and I was able to pick up the books at our local dollar store so it makes them really cheap to create. Today it was my turn to have our monthly CQTeers meeting and below are some of the fun things we tested out. The first picture is of our atc exchange. The theme this month was 'artists choice'. I did the top two, Sue did the middle row, and Irene's are in the bottom row. This picture is showing a technique that Irene taught. I can't for the life of me remember the name of the commercial product we were using (duh). Anyhow...it's painted on fabric and then a photocopied image is pressed into it with a brayer. After a short wait we peeled the paper off and were left with the image in the cloth. In theory. 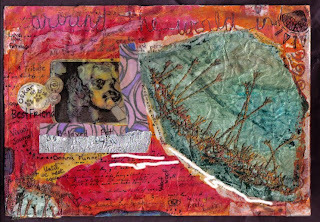 Mine seemed to want to hold onto the paper and the only way the image would stay was to leave a thin layer of the paper. We aren't sure why it happened that way, but nevertheless I really like the effect. I like how the image 'lost it'd sharp edges'. I think this would be fun to take further. Perhaps painting...or tea dye?? I came up with the following three techniques, which met with varying degrees of success. This one is dripping alcohol inks onto shiny card stock and then spraying it with rubbing alcohol. The bottom pieces are done on the card stock and the middle and top pieces were experimenting on gold and silver paper. The gold won, I think. I'd like to try this again, only with the salt shaker handy to see what effect might come from sprinkling a bit on and waiting for it to dry. This technique was interesting, but I'm not too sure of the results. We tried using a heat gun to 'glue' fusible webbing onto card stock and then topped it with embossing powder and more heat. Technically the fusible web 'should' have stuck to the card...but....it was much happier either blowing away OR melting into a blob. The bottom (red) is the webbing. On the green card stock, the left part is the webbing, the middle is an ironed-on piece of HeatnBond, and on the right I stuck the HeatnBond on and hit it with the glue gun. Ended up liking the HeatnBond/glue gun/embossing powder the best. Finally, we went back to our childhood and played with crayons! We used cheap metal graters from the dollar store and grated our crayons onto watercolour paper. A second sheet of waterc. paper was placed on top and then we ironed it until the crayon melted. It's a good idea to sandwich the papers between a couple of pieces of parchment paper to protect your iron. I think the next step will be to perhaps use some watercolour paints over top. Today's picture is why I'm fluffing about. This is a fur coat in the throes of being deconstructed and being made over into a teddy bear. I love making bears, but I do not like the fact that all the 'fluff' from the fur gets into absolutely everything and hangs around for weeks lurking in unexpected places. I've learned the hard way that, once you have the pieces cut out, to take them outside and give them a good shake. Just make sure you're not standing downwind!! I don't think Joyce could have stuffed one more thing into that box!! I love it all, and already have some ideas of a few things to create with my goodies. Thank you soooo much Joyce!! A huge thank you too to Donna for organizing this fun swap! 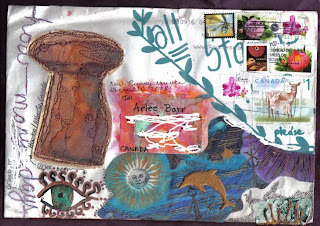 Arlee very kindly shared her jpg pictures of the mail art envelope so I am able to share them here. The first picture is of the back..... Second picture is of the front. My 'part' was the blue area with the dolphin & the sun. I wish I could have travelled through the postal system with it to see the reactions!! To those who have 'read me' from the beginning, my apologies for rerunning this doll - however, I've been asked to post her again, so here she is. I can't post a picture of what I've been working on the past couple of days because we're sworn to secrecy until the final Exquisite Corpse is revealed. I just got this one in the mail and have it ready to go right back out again. Inspiration struck the second I opened the envelope and I knew exactly what I wanted to do and it came together quickly. I really, really wish I could show it to you!! I forgot to make any mention of the needlework show,so....the pictures show the book I bought while I was there. 240 pages just like the ones in the second picture. There is inspiration galore! I also picked up a few issues of Fibre Trend magazine and a small package of floche thread from DMC. The show itself was good - knitting was big, of course. I was happy to see that silk scarves were nowhere to be seen (unlike the last time I was there when it seemed every second booth had them). Beads were very much in evidence but I managed to steer clear of them (which, given my magpie tendencies, was hard!). The Canadian Doll Artists Assoc. booth was somewhat disappointing...many of the artists I 'knew' from other years didn't seem to have dolls on display. There were a lot of wonderful 'sane' quilts (like an idiot, I forgot to take the camera). I was happy to see a small display of mixed media too. I eyed an embellishing machine but didn't buy. Maybe someday. All in all, a fun day for me (not so sure, however, about DH!!). Yesterday you will have noticed that I didn't post - we were back in the city again (taking my SIL to a medical appointment) and we had to drive in a snow storm! Yuck - snow is a BAD 4-letter word in my vocabulary at the best of times. The ground was pretty much white this morning when we got up and there's still a lot around despite it being a sunny day. I've had enough and am quite ready for spring, thank you very much. I finished the October Take It Further challenge piece today. Click on it to make it larger if you would like to see the details. Sharon also mentioned studio pictures, so...at the risk of boring those who have seen it before...here's part of mine. I oughtta be ashamed but, truthfully, I'm not! This is creativity for me. Here lies 'the blob'. Two years (almost) in the making and it's STILL NOT DONE!! I will never win any speed records with my knitting. It will be (if it ever grows up) the Einstein coat as shown below. 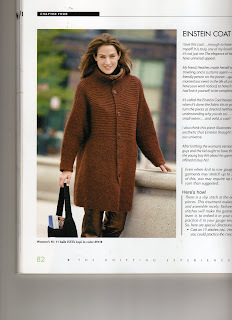 The pattern is this one from Sally Melville's 'Book 1: The Knit Stitch' book. Tomorrow I will be searching for funky buttons for it. Eternal optimist as I am, I figure I might just finish it sometime in the next year (or three). My long-suffering DH is taking me to the 'CreativFestival' in Toronto for the day, so it's unlikely I will be doing a blog post. Just gossip amongst yourselves! Door demolition has begun and now we just have to hope the new one ends up fitting in the hole. If there's some 'blue' air tainting the sky from this direction, you'll know why! More cottage pictures...enjoy! Actually I've been back a couple of days but haven't spent much time on the computer. Today I've been working on my TIF piece, but not much to show yet. So....cottage pictures!! ...just to let you know that I'll be away for a couple of days. We're going to visit friends at their cottage & will be back late Friday afternoon. Have a great Thanksgiving! I actually had an afternoon to stitch today, so I have something to show you! The block is progressing nicely. I found the piece of (antique) lace I wanted to use and it's been inserted. Picture is clickable! I haven't accomplished much today, but here is my block pieced together for the October TIF challenge. I've tentatively decided where I will put the image and the safety pin marks the area where I plan to put my button cluster. The next decision I have to make is where I will put my piece of lace and exactly which one I will use. Then it's on to embellishing - my favourite part! A friend gave me these wonderful plastic bobbins, some of which already have some floss wound onto them, along with some spools of perle cotton. I was thrilled with the bobbins to say the least. I plan to rewind the floss onto my normal storage system and then wind some of my perle cotton spools onto the new bobbins. It sure will make storage a lot easier! Spools take up so much space and are notorious for escaping their confines and rolling all over the floor. The cat is the only one that is thrilled with that!! Obviously I did nothing in the crafting line today, nor did I have time to even look in my studio. All I have to offer is this view of the neighbours tree. It was amazing how the sky was so dark after the rain and the sun was shining just on the treetop. Today I have two pictures of some old lace I have in my collection. All of these were made by my grandmother who passed away in the early 1960's. I have a number of the motifs in the top picture that are loose the these pictured here are joined together with some dark brown crocheting (which I suspect might have been done by my mother). These pieces are also by my grandmother...I have a number of the square motifs (all loose). The strip in the middle is knitted and was most probably meant to trim a pillowcase. The bottom piece is crocheted and also for a pillowcase.